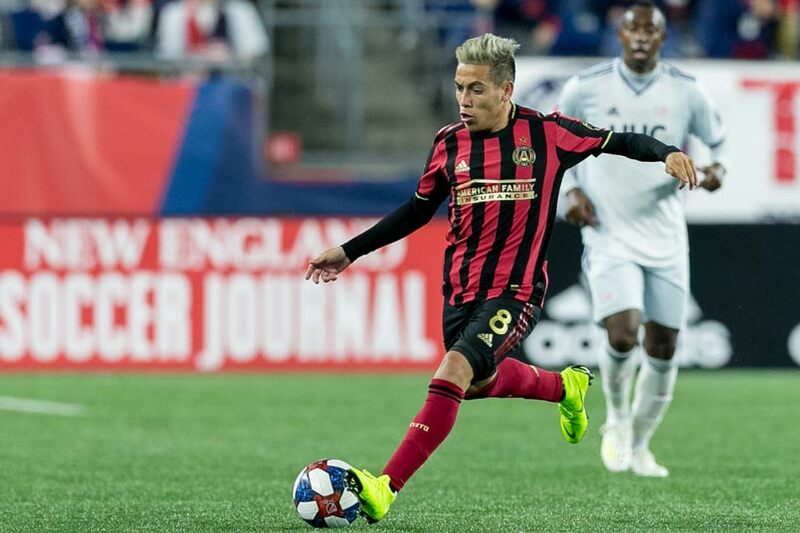 By Jason Davis – WASHINGTON, DC (Apr 17, 2019) US Soccer Players - Ezequiel Barco arrived in Atlanta in early 2018 with massive expectations in tow. A drawn-out chase for the Argentine teenager by Atlanta United only intensified the pressure for him to perform. Fans in Atlanta used the #BarcoWatch hashtag to chart the progress of the transfer, feeding into the idea that he would light MLS on fire when he finally made the move north. A soccer press that elevated Barco by declaring him one of the best teenage players in the world didn’t help limit the presumed impact he would have on Atlanta and MLS. Omar Browne arrived this week in Montreal with very limited expectations. The Panamanian attacker joined the Montreal Impact officially on Tuesday via a loan from CAI Independiente in his native country. The club surprised with a run to the quarterfinals of the Concacaf Champions League, including a defeat of Toronto FC in the Round of 16. Browne earned himself a move to MLS on the back of his performance. On the Impact’s website, head coach Remi Garde shared some positive words about Browne. There’s no telling how much time Browne will get to prove himself at MLS level. Injuries are a problem for Montreal, so he might get a shot to help his new team. For Atlanta, Barco entered Saturday’s game in New England as an injury replacement for Eric Remedi. He proceeded to make the most of his chance, scoring both goals in United's first win of the season. If the defending champions go on to execute a turnaround from their poor start, Barco will get a lot of credit for being the spark. Aside from coming from clubs called Independiente, Barco and Browne don’t have much in common. One joined as a future superstar expected to help Atlanta win championships, and, when the time comes, fetch a hefty Miguel Almiron-type transfer fee. The other is a squad player that secured a contract in MLS because of his showing in a sometimes maligned regional competition. It would be easy to say that one represents the future of MLS while the other is a vestige of the league’s past. Barco’s signing not only further confirmed Atlanta’s ambition, but it also points to a time when the MLS is more active and more willing to spend in the international transfer market. There were certainly other options available to Barco when it came time for his departure from Argentina. That he chose Atlanta bodes well for MLS. $15m purchases won’t be the norm anytime soon, but there must be a first. Browne is the type of player MLS fans know well. Forgetting for a moment the specific talents that make him unique, Browne’s profile is an MLS staple. When the budgets were smaller and a $15m move for a player was barely a glint in the commissioner’s eye, American and Canadian clubs mined the fields of Central America for talent voraciously. The list of key Central American figures in MLS history is long and, by MLS standards, illustrious. A pair of Salvadorans led the way for the League’s original dynasties. In DC, Raul Diaz Arce achieved legend status as part of the United’s first two MLS Cup titles. Diaz Arce scored 38 goals in two seasons, establishing an early mark for the future of MLS strikers. Mauricio Cienfuegos was a crucial part of the LA Galaxy midfield during a run that earned the club numerous trophies, including the 2002 MLS Cup. Guatemalan striker Carlos Ruiz played for five different MLS teams, including DC United, the Galaxy, and FC Dallas. His occasionally shady antics on the field and cleverness in front of goal made him one of the league’s foremost villains in the first decade of the 21st century. That so many clubs signed “El Pescadito” points to Ruiz’s talent as well as his reasonable cost. When MLS went looking for help that wasn’t going to break the bank, they looked to Central America. They still do. The Houston Dynamo is one of three remaining undefeated teams in MLS this season. Their success is thanks in large part to a pair of Honduran players who help spring their deadly counterattack, Alberth Elis and Romell Quioto. Elis has been good enough in Houston that only Carlos Vela’s other-worldly start and the goals and star power of Zlatan Ibrahimovic overshadow his play. Such is Elis’s talent that Houston has already turned down at least one multi-million dollar transfer offer for him. In combination with fellow winger Romell Quioto, Elis provides the Dynamo a connection to Honduras that could even pay future dividends with future talent coming to Texas. Costa Rica has a large presence in MLS, as you’d expect from one of the region’s top nations. There are 12 Costa Ricans sprinkled across the league, many of them key starters for playoff caliber teams. The latest Tico to sign with MLS is a returnee, Giancarlo Gonzalez. The Columbus Crew sold the defender for a hefty fee by the Crew back in 2014, an example of MLS serving as a stepping stone for Concacaf’s brightest. Browne’s own Panama has contributed the Red Bulls full back Michael Murillo, a 2018 All-Star, Roman Torres, a staple of the Sounders back line in 2017 and 2018’s MLS Cup runs, Cristian Martínez, a reserve player with the Fire, and a pair of Quakes, Anibal Godoy and Harold Cummings. Central American players are old news in MLS and rarely does a player from the region get much attention when he joins the league. Though there are South Americans who aren’t stars, the league’s push into CONMEBOL countries makes for high profile moves. Barco’s signing followed that of Miguel Almiron and preceded Pity Martinez’s transfer from River Plate. MLS is moving quickly in new directions, pulled along by clubs like Atlanta. The willingness to spend money, engage in the business of selling players, and prove itself a beneficial way station for talented South Americans like Barco will speed up the process of bringing more expensive, higher quality foreign players. What does that mean for the league’s bread-and-butter, players from lesser regarded nations in the small band of land that connects Mexico to South America? The jobs that were once available to the best of the region will likely dry up, pushing Central Americans with personal ambition to other nations or lower leagues. For now, however, MLS is a place where a $15m signing worthy of a spot on a list of the best teenage players in the hemisphere can do a star turn on the weekend. It's also where a club can grab a largely unknown, budget Central American talent a few days later. It's a combination of the old approach and the new path forward that won't go anywhere for a while. MLS is a work in progress. Nothing illustrates that fact better than the very different backgrounds of Barco and Browne.